Brussels Griffons trace their history back to Belgium, where they were developed to hunt and kill vermin. They were created from several breeds, including the Affenpinscher, Pug, and English Toy Spaniel. The Brussels Griffon came to America in the late 1890s; however, their numbers shrank during World Wars I and II when owning a dog was a luxury that few could afford. Thankfully there were a few breeders who kept the breed going. Brussels Griffons became trendy in the late 1950s and again in the late 1990s after starring with Jack Nicholson in the movie As Good as it Gets. 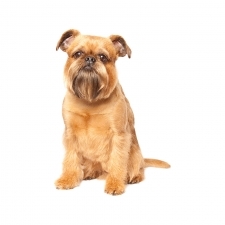 Brussels Griffons have been known as the “Velcro” dog. They usually attach themselves to one or two people and will want to be with that person all the time. You will never be alone again. They need a lot of companionship and if they don’t get it, they can become withdrawn and sullen. They are an intelligent, cheerful dog with a terrier disposition. They love everyone and are affectionate, feisty, charming, and cheerful. Brussels Griffons make good watchdogs, and will bark when someone comes to the door. They like to be active and need daily walks. They love to run and play, running circles around your house just for the fun of it. These little dogs make wonderful family pets; however, they don’t usually get along well with children. They are so charming and possess almost human-like expressions. Brussels Griffons usually weigh between 6 to 9 pounds and stand approximately 9 to 11 inches tall. They are a small dog with a tiny but sturdy build. Their coat is long and wiry or short and wiry. Their color combinations can include shades of black, tan, and red. Their nickname is “Monkey Face,” and they all look like heavily bearded, grumpy little men. Brussels Griffons don’t usually get along well with children, so you’ll need to keep an eye on them when children are around.